A few days ago I was thinking about the sleepwear anthotypes. Thinking about how they are rather uncomplicated. Basic photograms done with plant pigments. This probably stemmed from one of the onionskin anthotypes I did this winter. While it succeeded, it also seemed like it was one note. It was too simple and the single layer of pajama top I used didn’t immediately read “sleepwear”. Last summer, Bridgette was asking provocative questions as she is apt to do. One of these questions related to the layering of color. One on top of the other. I was initially convinced that the water content of the successive layer would wash away the anthotype exposure underneath much like invasive rain water had done to a couple of anthos. A few weeks ago I was actually layering beet root juice (from a can) on top of existing onionskin and it didn’t have an effect on the layer below. Both remained distinct which led me to the idea of layering exposures one on top of the other. Here’s a couple of images to illustrate where this is heading. 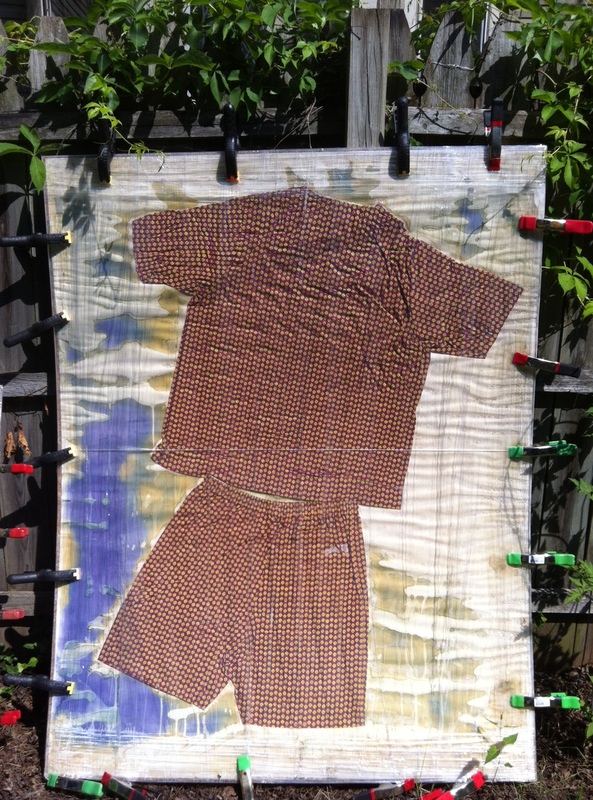 I am heading towards anthotypes 2.0 which involves the layering of his and her sleepwear in the final anthotype. Below is the aforementioned onionskin anthotype with one layer of rose petal emulsion on top. Below is the same anthotype with three layers of red rose petal emulsion. 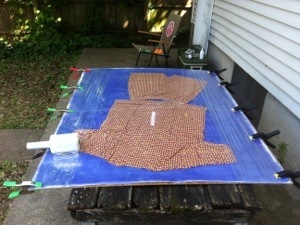 The light resist is a bed jacket donated by Kristi Bogle which has a connection to the Roswell museum of art. I am sure that there is some rule out there that for purposes of professionalism, one does not show one’s failures. Here is one such failure. 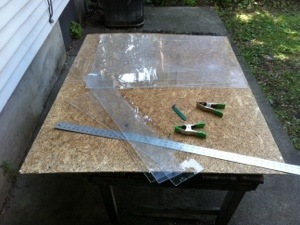 I decided to employ stretch wrap as a water barrier in addition to the 3 panels of clear acrylic. Never again with the stretch wrap. Photo courtesy of Christina Zuercher. and here is attempt #2 with a different pajama set and a red rose emulsion. I still am struggling with composition with the men’s pajamas. They are so …static. Note from an ephemeral photographer who happens to also make ephemeral things. I wrote that as I began an attraction and repulsion to SnapChat but on to anthotype matters. I am not terribly enthused by this pajama anthotype (arrangement and pattern) which means it just might surprise me in a couple of weeks. You can look at the arrangement from yesterday’s entry. 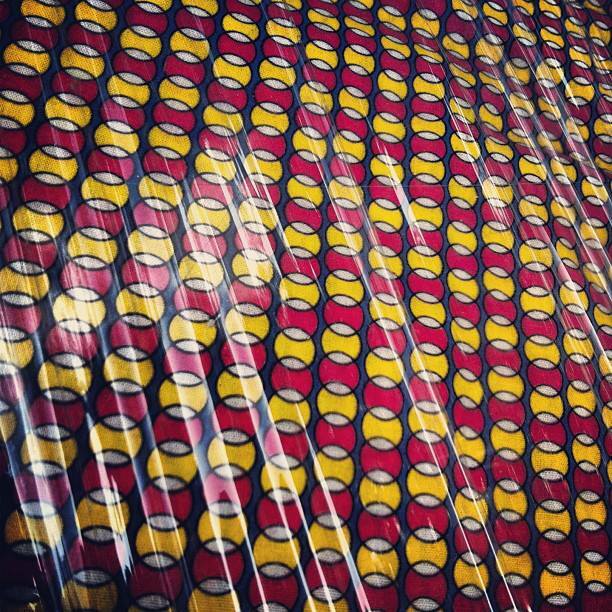 Here is a detail of the pajama’s textile pattern. Today doesn’t really count (as day one). 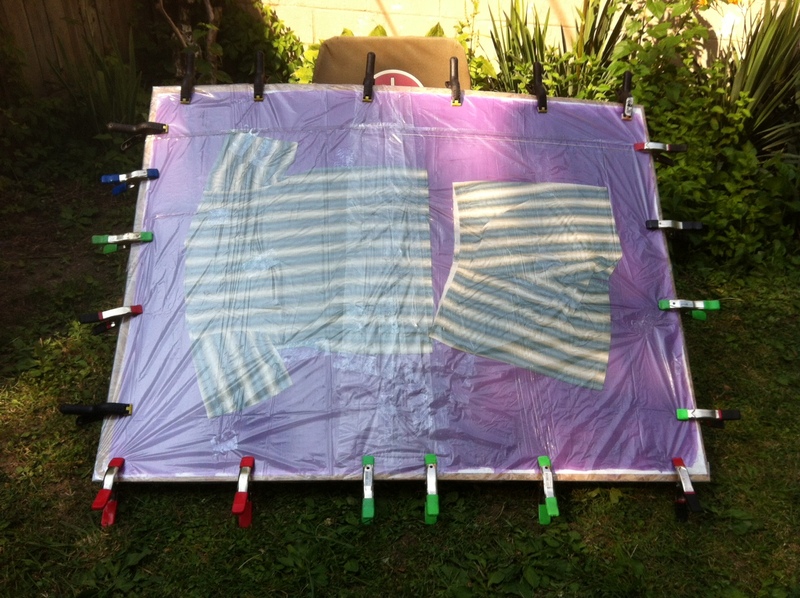 I have had this sheet of 59″ x 46″ coated water color paper waiting for a couple of things to occur. 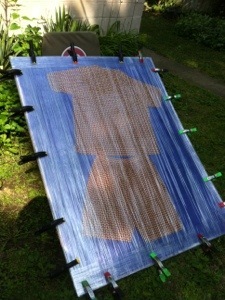 The first item was getting a sheet of OSB cut down to accommodate the paper. I got around to that late last week. Forty-six inches happens to be the widest sheet the Subaru Forester will accommodate. The second hold-up: I was planning on using another peignoir but decided that if I was going to continue to use pajamas in this series that the added opacity of men’s sleepwear would be best served by exposing the anthotypes as close to the summer solstice as possible. Today’s mail produced a vintage set of Sears summer pjs. The third obstacle actually has a fourth obstacle associated with it. Working this scale means either buying a sheet of plexiglass or scavaging the garage for an alternative. Since a new sheet of plex would be around seventy dollars, I opted for the latter. I ended up cutting down three scraps that when pieced together would cover up the paper and pajamas. That was today. Last Saturday I attended a presentation on proper techniques for packing art work for shipping. It was during that session that I was introduced to plastic cling wrap. This is what I ended up using (along with a small amount of packing tape) to secure the three separate pieces of plex, hopefully creating a water barrier in the process. Tomorrow will be officially day one.